Amazon is even getting into education now! 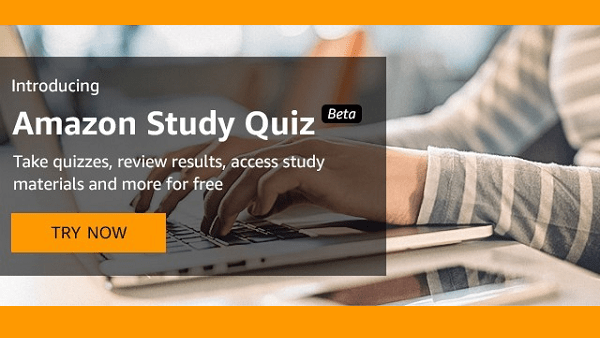 Amazon Study Quiz lets you take quizzes, review results, access study materials, and more for free. The written resources are provided by Lumen Learning, and the videos are on YouTube. Quiz yourself: Take practice quizzes on topics covered in your introductory classes. Track your progress: Review your past quiz results and track your progress throughout the semester. Know your gaps: See what concepts you still need to master so you know where to focus your time. Get help: Access curated study materials for extra help on the topics you need to learn. These quizzes and review materials align with a standard Biology 1 course. They cover biological molecules, cell structure and function, cellular metabolism, cellular reproduction, genetics, and evolutionary biology. These quizzes and review materials align with a standard Biology 2 course. They cover the history of life, the diversity of life, the structure and function of plants and animals, and ecology and conservation biology. These quizzes and review materials align with a standard Microeconomics course. They cover how individuals and companies make decisions and how those decisions impact the economy, how markets work, and how governments can affect markets. These quizzes and review materials align with a standard Macroeconomics course. They cover overall levels of income, unemployment, inflation, federal monetary and fiscal policy, and global economic issues. The Beta is free and available to students in the U.S. until June 30, 2019. However, the introductory Biology 1, Biology 2, Economics 1 and Economics 2 etexts are all available for free from OpenStax.